List boxes can act as a set of radio buttons (allowing people to select exactly one choice from a set of mutually exclusive options) or as a set of checkboxes (allowing people to select any number of choices from a list of options). List boxes can be configured to show more options than a drop-down menu while still taking up less screen real estate than a list of radio buttons or checkboxes. Despite these advantages, the dual nature of list boxes (mutually exclusive single selection or multiple selection) tends to cause problems for many people. 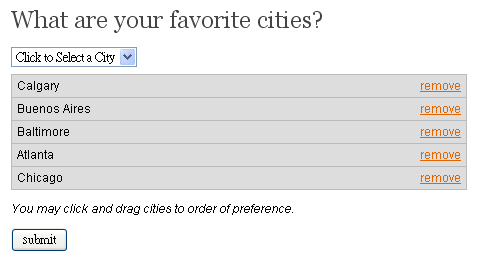 As a result, list boxes are rarely used in Web forms. Joe Mako recently pointed me to an alternative solution for selecting multiple options within a form: Alternate Select Multiple. Doesn’t require user to Ctrl-Click or Shift-Click multiple elements. Instead users of your form can add or remove elements individually, without risk of losing those that have already been selected. Selected elements are always visible while unselected elements are always hidden (within a drop-down). Unlike regular list box elements, those on Alternate Select Multiple are optionally sortable with drag and drop. Article about the advantages & disadvantages of this approach and others for multiple selection in Web forms.